A fine example of modern design, the Aqua collection Freestanding Soaking Bathtub is an excellent option to soak, bathe, cleanse and rejuvenate. 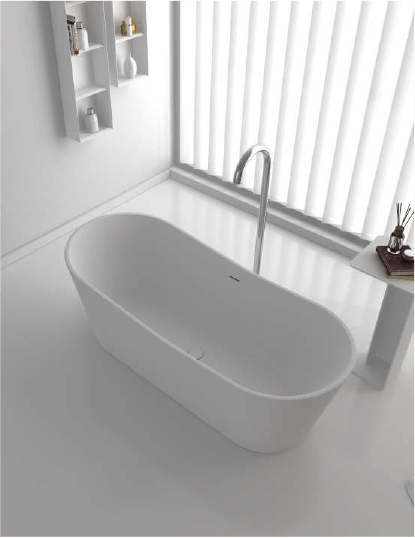 Simple yet enticing, this bathtub features clean lines and immaculate cuts, which are quintessential of the contemporary style. It has a deep and wide surface, which allows complete immersion to enjoy a warm and refreshing bath. The Aqua Freestanding soaking Bathtub from Orton is made from premium-quality acrylic to ensure optimum strength and durability. It has a gorgeous white finish, which looks sophisticated and blends seamlessly with most decor styles. 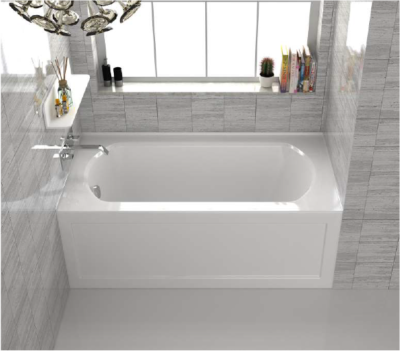 Oval in shape, this bathtub is freestanding, and can be easily installed without much effort. It is warmer to the touch and offers more comfort than traditional tubs to ensure a relaxing bathing experience. You can also choose to place some aromatherapy candles on its wide, flat edge to ease stress and calm your senses. Low on maintenance, it can be easily cleaned with a mild abrasive product to keep away germs, stains and odor.